Fire and music create a gathering for hundreds of participants each Tuesday and Wednesday night in July as part of Artown. Over 1,000 people gathered at the corner of Sierra Street and Island Ave for the opening of the temporary interactive art installation and performance venue. 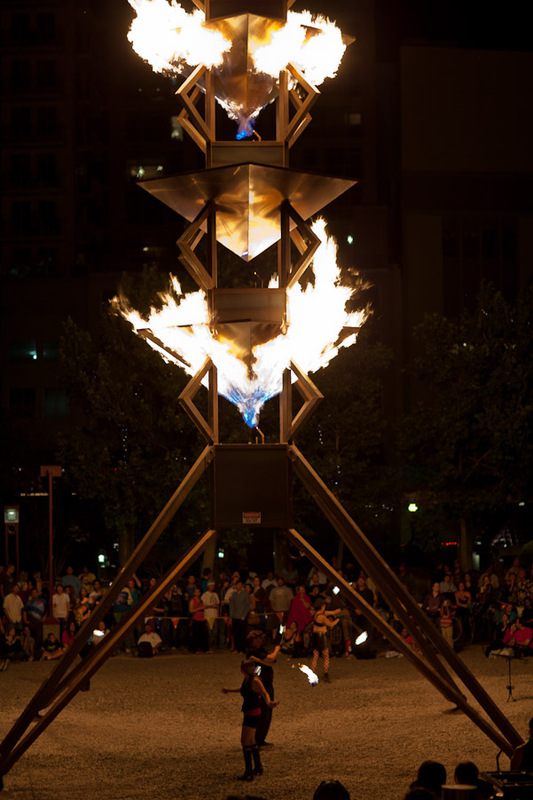 Hundreds of adults and children have enjoyed the unique experience of controlling a pulsing tower of flame effects while DJ’s spin dance music for the performers and pubic alike. 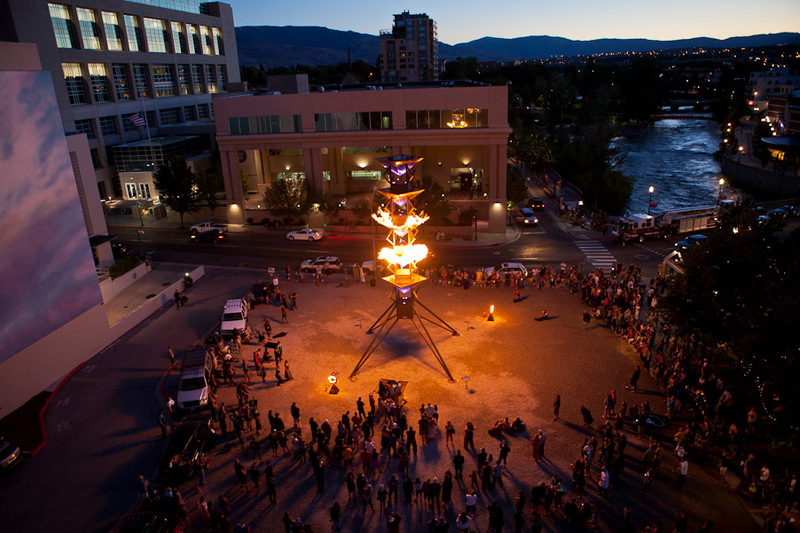 Brought to Reno by the Black Rock Arts Foundation and exhibited at Burning Man in 2010, Spire of Fire, by artists Steve Atkins and Eric Smith, towers over 48 feet above the Riverwalk. 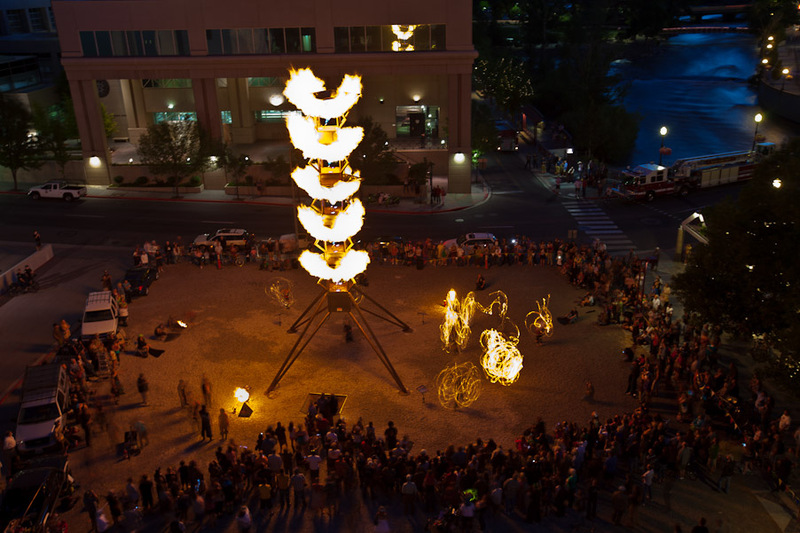 The tower of pulsing flame effects will be the site of continued fire dance performances by Controlled Burn each Tuesday night at 8:30pm, with “Get Hooped” taking over Wednesdays with Velocity Movement and BoHo Hoops. All of the performances are free to the public with Tuesdays featuring a beer and wine garden provided by Wild River Grille. During Artown, fire dancers and spinners from Controlled Burn will entertain Tuesday evenings 8:30pm – 10:00pm. 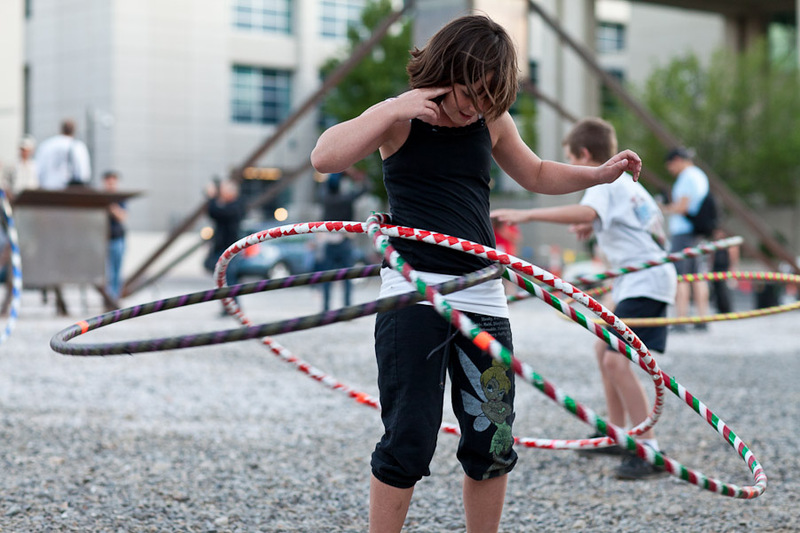 Hula Hoopers from Velocity Movement and BoHo Hoops present “GET HOOPED” at Hoop Jams on Wednesday evenings from 7:00pm-8:30pm. All levels and ages are welcome.